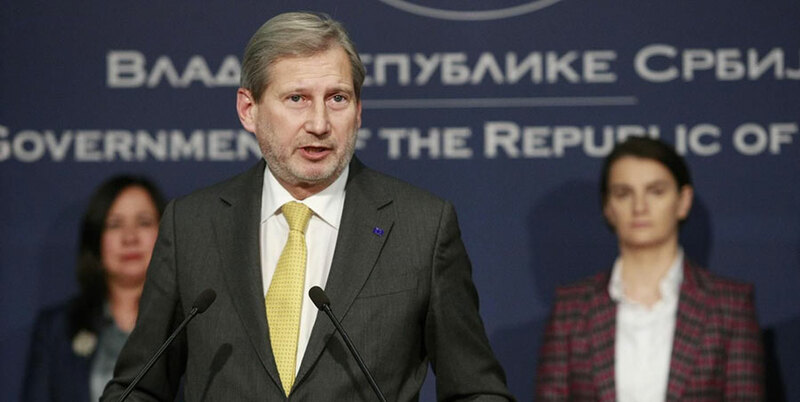 EU accession does not concern only the Government, but the entire nation and as such it should unite all parts of the society, said European Commissioner for Neighbourhood Policy and Enlargement Negotiations Johannes Hahn following the meeting with Serbian Prime Minister Ana Brnabic and the signature of Agreement on sectoral budget support for Serbia. Prime Minister Brnabic said that the contracts were a sign of partnership with the EU, not only in political terms, but also in other aspects of development, social or economic. “It should be a national goal that will bring everyone together on a journey to the final destination,” Johannes Hahn told the press. In that context, the agreements signed today only strengthen Serbia’s position on the EU path, he said. Speaking of the agreements, Hahn said the first one, worth EUR28 million, was aimed at improving border management, whereas the second, offering assistance to the tune of EUR16 million, was intended to help Serbia tackle the migrant crisis. “We’ve had a huge wave of migrants. Now, we need to help the countries that were hit by an unprecedented number of migrants,” Han explained. Hahn added that since 2007, the EU earmarked more than EUR2 billion in grants for Serbia, placing itself at the top of Serbia’s donor list. Hahn said that yesterday’s Enlargement Strategy mentioned the year 2025 as an indicative accession date, adding that 2025 should be seen as a feasible, but at the same time highly ambitious date. “The pace at which the country will meet established conditions depends entirely on Serbia. We are certain that the authorities here are fully committed to this end,” he said. Prime Minister Ana Brnabic described the Agreement on Sectoral Budget Support for Serbia – worth EUR28 million – signed today, as a sign of partnership between Serbia and the EU, not only in political terms, but also in other aspect of development, e.g. social and economic. Brnabic said that today’s was the third signed contract, and reminded that the first one, aimed at public administration reform, amounted to EUR80 million, whereas the second, concerning direct support for education, secured EUR27 million for Serbia. She described the EU Strategy as a great opportunity for Serbia. “We understand there are no guarantees, and we understand where the focus is, what our obligations are and what we should do to meet them. In the coming period, the Government will keep on working to implement all the necessary things in order to take advantage of the opportunity ahead,” Brnabic said. She added that Serbia was faced with major tasks and challenges and pointed out that the Government was fully committed to doing what it takes to move Serbia closer to membership. “The EU is our strategic goal, our top priority and our national interest,” the Prime Minister noted. Speaking about the Belgrade-Pristina dialogue, Hahn described it as a serious and intense dialogue with normalisation of relations as its final goal. “I would rather not anticipate the outcome of the dialogue; it is much too early to say what the real outcome will be, but what it does matter is reaching a legally binding agreement,” Hahn said. Asked to comment on the aspiration towards unification with Albania, nurtured by Albanians in Kosovo, Hahn said that everybody was aware of the need to observe rights and existing borders. “After all that’s happened in the region, reconciliation, mutual understanding and good neighbourly relations should be put at the top of priorities,” Hahn said.